Donning their gas masks, flame throwers, and edupunk t-shirts, Jim and Tom laid out the warnings of zombies and where they lurk in educational technology. The audience was warned before hand that this was going to be an intense, almost radioactive presentation, so we provided them safety glasses ahead of time. They started asking the audience what their fears were. [16:33] Redbaiters Stanwell: What are scared of? Jim and Tom then launched some opening strongly worded (and pictorial) warnings about zombies and where they lurk. And then when Jim yelled “Look all around you!” pandemonium broke out- the sky went dark, the corporate placards revealed their true hidden messages, and several zombies revealed themselves from their clever “normal person” disguises. Jim and Tom managed to thwart them off (for now) with their flame guns. Now this was just the fun part. Tom and Jim went on to succinctly describing the ideas of syndication, aggregating, tagging, re-organizing content using free, open source tools that liberate your organization from the zombie grip. Now while I’ve been tuned into their work for a while, I could tell for the audience the power shown in the UMWblogs examples and site wide feed tagging were really revolutionary. You can get more of their resources, including the preso slides, from their conference session description on the NMC web site. 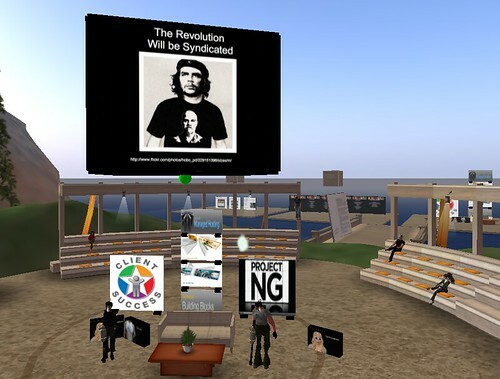 I was there, and along with their “revolutionary” ideas I was also totally impressed by how they took full advantage of the medium of Second Life to deliver a presentation in a way not possible in person (at least I hope that they don’t break out the flamethrowers and zombies in their next in person presentation). My 10 year old daughter was watching the whole thing with me, laughing her head off, and said that she wished her teachers would let them kill zombies in her class. So do we all, on more levels than one. Pingback: The Revolution will be syndicated | LiteratÃºrame! Thanks so much for capturing this – it seems important to note that without (I’m assuming your) expert 2nd life camera work, this might have been lost forever instead of becoming the instant “cinematic” experience it now is. Nicely done. And thanks for keeping the audio rolling at the end, the sheer joy in Jim’s voice is priceless. 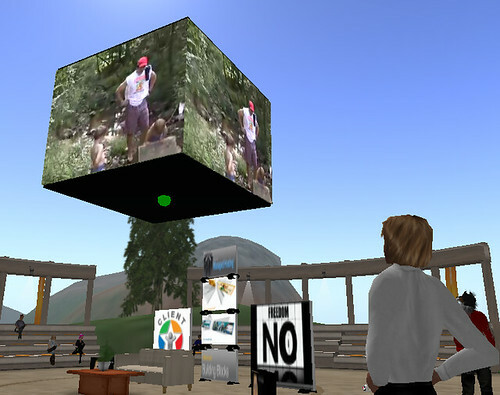 Thanks Scott, but I was not at the camera; that was the work of the folks at LearningTImes who did all the live stream work from SL and recording. 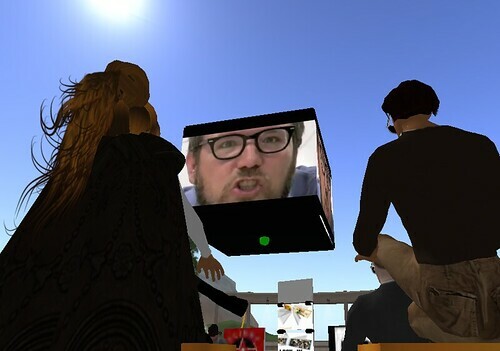 Big thumbs up for Wirecast software that managed the streaming/recording, and that said, doing live virtual camera in SL is far from easy, especially with wild stuff like dudes in gas masks nuking zombies. Awesome! I wish I was there. I am terrified! I think I have been bitten by zombies all around me. I am so out of touch and need a good flaming.. at least an IM from CogDog any time something like this is about to go down.